The goal of the Clark Humanities Museum, which opened in 1970, is to give students the crucial opportunity to engage directly with original works of art and other artifacts of material culture related to their courses – an irreproducible experience that sharpens critical inquiry, fosters interdisciplinary thinking, and offers the keen poignancy of authenticity in our increasingly virtual digital age. “The Human Form, in clay, wood and bronze” with over forty 3-dimensional works from contemporary ceramics to 18th century bronze Buddhist statues. 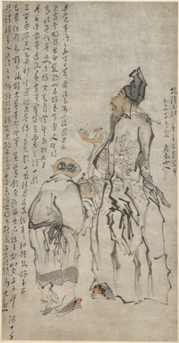 “Deities and Common folk: Chinese art from the Scripps College Collections” with a dozen Chinese landscape and figural paintings from the 16-19th centuries.